for Web Application Firewalls (WAF). See what's in the report? 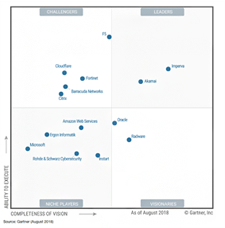 Discover the reasons Imperva has been named a leader in Gartner’s Magic Quadrant for Web Application Firewalls (WAF) for five consecutive years. From superior threat intelligence to attack analytics for enhanced monitoring, see why Imperva is the confident choice to protect your web applications. Imperva® is a leading cybersecurity company that delivers best-in-class solutions to protect data and applications – wherever they reside – on-premises, in the cloud, and across hybrid environments. The company's product lines help organizations protect websites, applications, APIs, and databases from cyberattacks while ensuring compliance. Learn more at www.imperva.com. Copyright © 2018 Imperva. All rights reserved.